Guru Movie Synopsis: The movie is about a young man, from a small village in Gujarat, dreams of making it big. 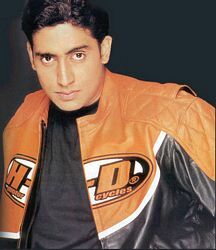 The dreamer, Gurukant Desai (Abhishek Bachchan), initially moves to Turkey and then to Mumbai with his wife Sujata (Aishwarya Rai) to fulfill his dreams. He soon finds out that the business community is a ruled by a few rich and influential people and getting into that is not going to be a easy task. He starts a company called Shakti Trading and starts to climb the success ladder in quick steps. Guru Movie Review: The story of Guru is very inspiring and can help you overcome challenges and obstacles in your life. Abhishek Bachchan has down well in a playing a complex role and deserves great credit. The movie is well directed and well acted by all the stars and hence the film is worth watching. This movie is sure to bring big awards for Abhishek Bachchan. Aishwarya Rai in Kerala for picturisation of a song for Mani Ratnam 's movie Guru starring Abhishek Bachchan . The first part of the song was shot in Mysore and the scene at Athirapally, near Kochi, known for its waterfalls. Arya Babbarn , son of Raj Babbar, has been added to the cast of Mani Ratnam�s Guru to play the role of Aish brother and Abhishek best friend in the movie. He is currently shooting for the movie in Karnataka with Abhishek Bachchan . The other male leads include Abhishek Bachchan and Madhavan and leading lady by Aishwarya Rai . Arya has already finished shooting for Hollywood film called The Partition in which he has a negative role opposite Hollywood stars Neve Campbell and Jimi Mistry. Bollywood beauty Aishwarya Rai got some minor bruises on her hand while shooting for Mani Ratnam�s Guru in Bagalkot, North Karnataka with Abhishek Bachchan . It was reported that she fell of a bicycle while shooting the scene and was rushed to a local hospital for treatment and released with her right hand bandaged an hour later with direction to rest of a day. The film is set against the backdrop of the first war of Indian independence (1857), with a song and dance sequence and wedding scenes at cave temples Badami and Halakatti bungalow. Mani Ratnam�s Guru is currently shooting in Bagalkot, North Karnataka with its main stars Aishwarya Rai and Abhishek Bachchan . Bagalkot, North Karnataka is known for historical sites like Badami, Aihole and Pattadakal which were visited by the two stars. Aishwarya was seen wearing a sari on her visit to the historical monuments. The movie also stars Mallika Sherawat who was not present in Bagalkot. Vivek Oberoi recently opted out of Mani Ratnam�s Guru . Vivek was to star opposite Vidya Balan with the lead role being played by Abhishek Bachchan and Aishwarya Rai . Mallika Sherawat has been signed by Mani Ratnam to play a cameo role in his next venture Guru. Sherawat's soon to be movie is Subhash Ghai's Shaadi Se Pehle , which is directed by Satish Kaushik and stars Akshaye Khanna and Ayesha Takia . Maniratnam will be shooting his movie, Guru, this month in London, Yemen and Peru with Abhishek Bachchan and Aishwarya Rai and hope to finish the shooting in about 20 days.